Sustainable Urbanism - New Directions, proceedings of the international workshop funded by the Qatar National Research Fund and supported by Qatar University. Curator & organiser: Dr. Anna Grichting. Publication editor: Dr. Lucy Bullivant, Urbanista.org. Book design: Kirstin Helgadóttir, 2018, Qatar University. Image © Kirstin Helgadóttir. The Sustainable Urbanism – New Directions publication – launch date 4 April 2018 – has been produced simultaneously in a fully illustrated, 154 page printed limited edition designed by Kirstin Helgadóttir and as a special issue of Urbanista.org webzine for liveable urbanism designed by &&&. 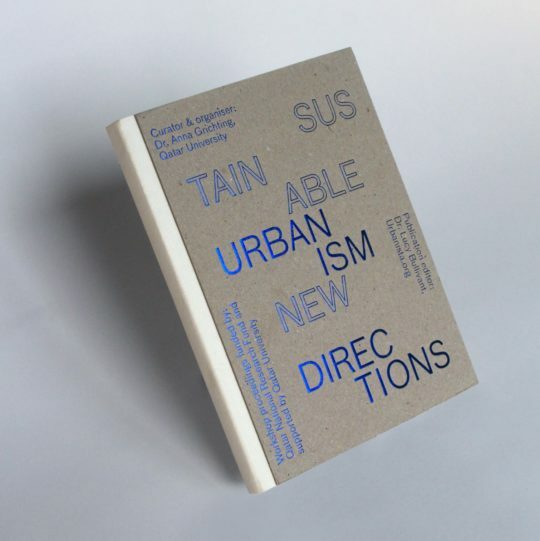 The Sustainable Urbanism New Directions book. To buy a copy the printed limited edition of the Sustainable Urbanism – New Directions publication, please send your name, full postal address including postcode/ZIP and number of copies requested, to Professor Anna Grichting, anna.grichting@post.harvard.edu. The cost per copy is: $US44; £44; or 160 Qatari Rials, plus P+P by airmail. An email will be sent in reply quoting the overall cost and how to pay. Please ensure that you put ‘Sustainable Urbanism New Direction book sale request’ in the subject line and include your full name and full postal address with zip or postcode. All rights reserved. No part of this publication may be reprinted or reproduced or utilized in any form or by any electronic, mechanical, or other means, including photocopying and recording, or in any information storage or retrievals system, without permissioned in writing from the publishers. © 2017, all authors. © 2017, Qatar University.